With the right sales tool, you can acquire in-depth information about how prospects engage with your emails and content. 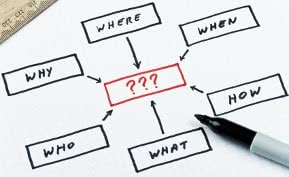 This information gives your sales organization valuable insights into effectively identifying and understanding your top prospects. Though the sheer amount of software platforms designed to optimize sales engagement continues to climb, in their effort to improve the sales team’s productivity, many of these applications become clunky and cluttered. The LiveHive Sales Acceleration Platform offers a welcome respite from that chaos, including deep analytics to track and better understand prospect behavior in a clean user interface with a dashboard that doesn’t overwhelm the user upon first glance. Setting up LiveHive is incredibly simple — upon signing up, you need only download the LiveHive extension for Chrome or Outlook and log in to get started. Steps for installing the toolbar are provided via email after signup, and you’ll also receive an email offering a brief walk-through of the platform if interested. Though one may find it inconvenient to download the Chrome browser if not already installed, getting LiveHive up and running takes only a matter of minutes. Once the extension has been downloaded, users can interact with the LiveHive toolbar directly from within their email client. At first glance, you’ll notice that the LiveHive dashboard includes both a main navigational menu and tabbed navigation options. Understanding these various navigation forms may take a few minutes of exploration, but shortly thereafter the purpose of each dashboard component becomes clear. Access to email templates, notification settings, recipient tracking and more is just a click away. One of LiveHive’s main selling points is knowing how your prospects are engaging with your emails and sales content — allowing you to tailor email follow-up based on prospect interactions with your content. The platform includes an “Insights” section that ranks prospects, logs updates on activity and shows data elements in graph or list format. You’ll also find details on which emails are performing best, as well as activity captured on hyperlinks and attachments. With LiveHive, you can begin reviewing email performance directly after sending — no need to wait for the database to update, as the system logs all email interactions in real time. You can set up LiveHive to notify you as soon as a recipient views your email, opens an attachment, shares an attachment or forwards your email. The platform also offers visual prospect ratings on engagement level and status of day-to-day interactions. In addition, you can automatically push prospect activity directly into your Salesforce CRM with one-click syncing, or set up the auto-sync feature to ensure all engagement insight gets transferred to your CRM. 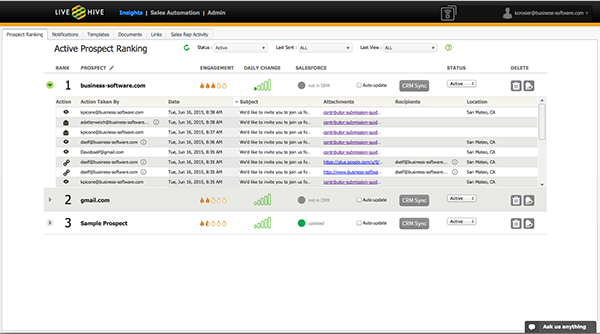 With its ease of installation, LiveHive can help sales teams immediately begin leveraging the email automation tools and engagement analytics to increase prospect understanding and personalize interactions. Even if you aren’t familiar with a sales-oriented email tool, LiveHive takes very little time to begin navigating comfortably and provides immediate insight into how recipients are viewing your emails. One of the standout features of this tool is that on top of the platform’s benefits, the LiveHive team does everything in their power to make sure you’re able to use the platform effectively — a step that many software companies fall short on. Customer service agents are very attentive to users, reaching out via email and phone to check in on your progress and see if you need assistance. The LiveHive platform also includes a built-in chat window where you can communicate with a support agent in real time, should you seek help navigating a specific function. Take LiveHive for a test run with their 14-day free trial, which includes unlimited tracking and templates for up to 5 prospects. Paid editions of LiveHive start at the wallet-friendly price of $24.95 monthly. To learn more, visit livehive.com. 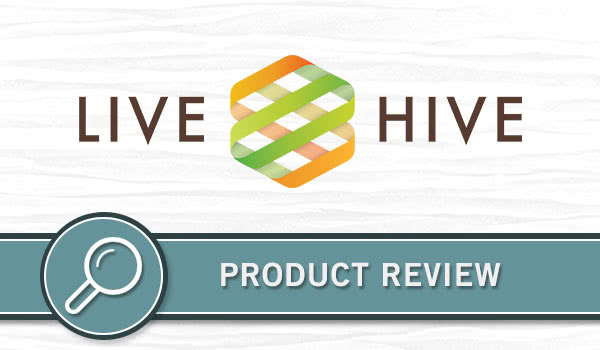 Check out other expert analyses like this LiveHive exclusive product review by visiting the expert picks and reviews section of the Business-Software.com blog. 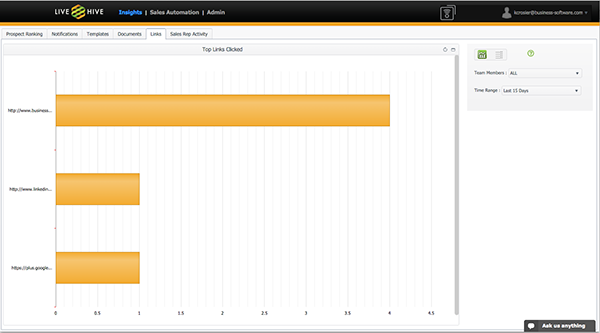 When you’re ready to compare solutions, you can also browse our FREE Top Sales Software Vendor Comparison Reports.